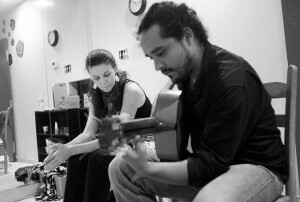 Flamencura’s music instructor, Isai Chacon, conducts group workshops in guitar, percussion (cajon and palmas), and flamenco singing at various times during the year. Flamenco music classes are recommended for seasoned musicians, beginner students, dancers, or those with no previous experience in order to enrich their understanding of the flamenco genre. Musicians specializing in instruments other than guitar and cajon are encouraged to contact Isai for individual or ensemble lessons. Flute, strings, piano, and other instruments make a valuable addition to modern flamenco music. All music students must bring their own instruments. For more information or to schedule a lesson, write info@flamencura.org. All classes are held at Flamencura Studios, 7113 Burnet Rd. #111.